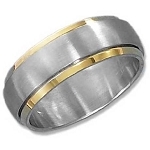 Those with tactile fixations may want to stay away from this one.That's right, not just one, nor two, nor three, but FOUR spinner rings fixed to one band. 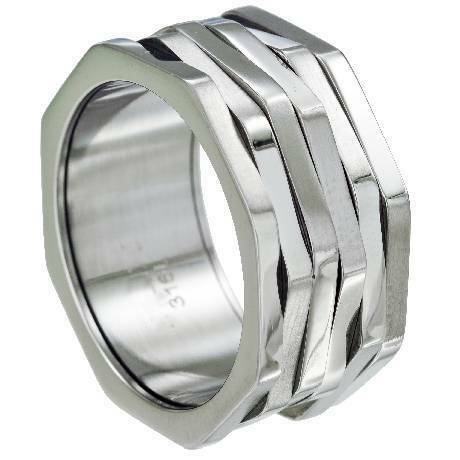 This ring isn't just a piece of jewelry - it's a kinetic masterpiece.If you want a ring that truly moves with you, that looks magically alive on your finger, this is the piece for you.For the soul that's truly unique, our stainless steel spinner ring is the perfect choice. This is a fun ring! It's not serious or sophisticated, just happy and playful. When I wear it my mood immediately lightens. I like the highly-polished finish and the smoothly-spinning rings that never stay in one position for long - every time I look at it it's different! 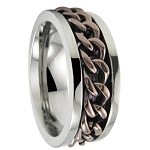 One word of caution: a very wide ring like this feels tighter on the finger, so consider ordering a half size up. Perfect ring, true to size. Very artistic looking, but also very masculine. My man has received so many compliments and positive comments on this. It's a great conversation piece. Everyone wants to know where he got it! Bought for my boyfriend, he absolutely loved it.. He Fidgets with it constantly which was the reason I got it for him in the first place. great ring! my son loved it!